The people of Haiti live in the poorest country in the Western hemisphere. On Tuesday night, 4 October 2016, their island was hit by Hurricane ‘Matthew’ - the worst hurricane to hit the Caribbean in more than a decade. Haiti was hit by 140 mph winds, ripping apart whole communities, with upwards of 1000 dead and hundreds of thousands left homeless. Typhoid and Cholera is already present on the island and with their infrastructure wrecked, the urgent need is for shelter and for clean water. 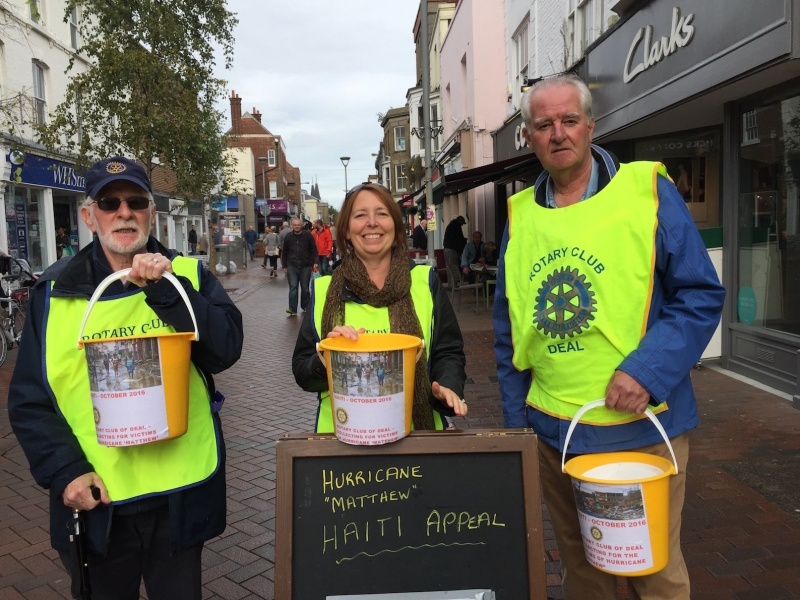 Deal Rotarians decided we should do something to help and organised a street collection in Deal on Saturday morning 08 October, to appeal for money to purchase water filtration equipment to send to Haiti. This has enabled us to purchase (via Rotary Club of Brynmawr) twenty family size ‘Lifestraws’ (water filtration equipment), each set which will produce 18,000 litres of pure and safe water - in total the twenty sets will provide 360,000 litres (80,000 gallons) of clean drinkable water, desperately needed to help prevent the spread of waterbourne disease. The filtration equipment we’ve purchased will be leaving the UK by air on Thursday and flown to the USA. The US Airforce will then be flying the equipment to Haiti where it will be arrive over the weekend, to be made available to communities most in need.